They won't have to because they didn't give a definite starting date. They have admitted they messed up when they shared that vid with the 21st in it. Yes they did and yes they have ALSO said probably not going to happen. You are both right! Wohoo everybody wins. Haven't we had a previous legendary start on a Friday before? I know we are all keen and eager, but they will come in due course. We've had the kit reveal now, so have to think it will be imminent (aka the new "soon"); and if it's tomorrow: great; equally if it's next Thursday: that's fine too. "The previous version of this video went live earlier today that contained a date of March 21st. This was posted in error and the date is not finalized at this point. 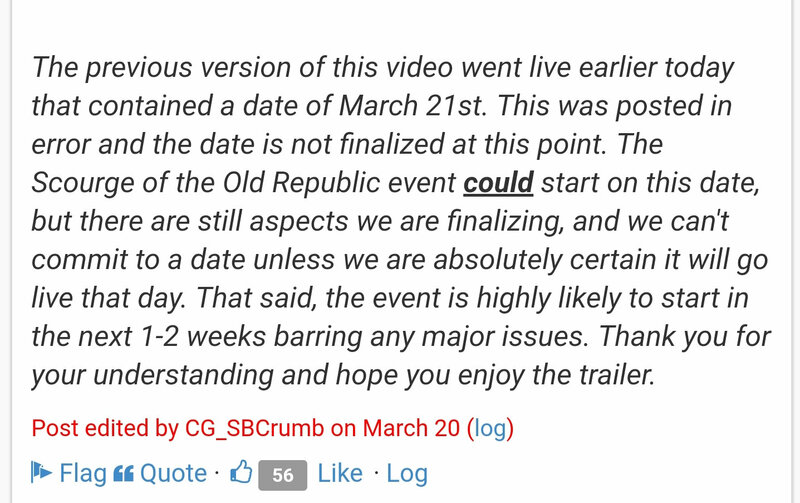 The Scourge of the Old Republic event could start on this date, but there are still aspects we are finalizing, and we can't commit to a date unless we are absolutely certain it will go live that day. That said, the event is highly likely to start in the next 1-2 weeks barring any major issues. Thank you for your understanding and hope you enjoy the trailer." Anyone who can read should find this thread silly. Perhaps the all powerful @Kyno will see fit to close it. We just figuring that intern communication is as bad as community communication. If you can see the obvious, you find your on post silly. Because no one on these forums ever pitched a fit when the Devs used the term/words "coming soon", right? To be fair...many thought it was going to be sooner. The 21st was logical based on how they do things and the video in the very least showed that was their target. And we have seen the problems with roll outs...and in all instances the silence from them always results in making it worse. How many times have we heard they will work on communicating better? Anyone who can read should find this thread silly. Perhaps the all powerful Kyno will see fit to close it. This seems pretty not silent and clearly communicated, on this issue. @kyno you are absolutely right; they gave fair warning that it might be delayed; and may not be the 21st. It was very decent of them to do this earlier this week too (I don't mean that sarcastically either; it was a good pre-warn). "we did say it could be 21st, but we are not ready; it does not look like we will be releasing tomorrow either; but it is still our intention to release next week; we are just finishing some bits... we know you are all excited... but due to the way TWs work, and the fact we were not able to release today (as pre-warned might be the case) then please don't expect until after the war, at the earliest (ie we hope it some time next week). Thanks for patience. will be in touch with update next week"
That would be good communication. It's not always about the answer; and it is often not the answer people want... but it's about the communication. There have been a number of great posts recently from CG (that warning included) where thought processes; considerations; warnings, have been posted: these are all brilliant! What would be equally well received is an update about release (even it is as above, with no committed date, but just acknowledging people's hopes for today, based on the potential, and to calm the forum noise). Perhaps this thread could now be called, "when the 25th (or possibly later) is still the 25th (or possibly later)."